Are you filled with a strong sense of peace right now? Or are you struggling to overcome fear and worry in your life? It's true that we live in a world filled with anxiety and trouble. But as Christians, we are not of this world. We're seated in heavenly places with Jesus, who is our Prince of Peace! God doesn't want the cares of life to get the better of you. He has good plans for your future...plans to give you hope, no matter what you may be facing (Jeremiah 29:11). As you place your trust in the Lord, the Bible says you can have a peace that passes all understanding, and guards your heart and mind through Christ Jesus (Philippians 4:7). And that's what this booklet is about. 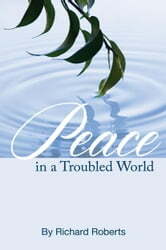 Yes, you can learn how you can have God's peace in the midst of a troubled world and be strengthened to face life in faith!